Drew Estate's initial joint venture between its own Subculture Studios and Joya de Nicaragua produced the highly successful My Uzi Weighs a Ton (MUWAT) cigars. Ever the innovators, Drew Estate immediately began experimenting with another blend, this time using American-grown, fire-cured tobaccos. 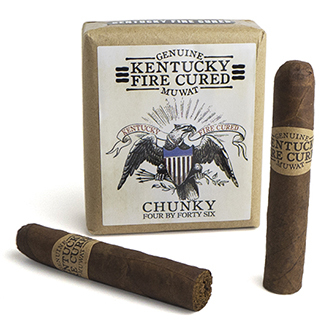 It turned out to be a bit more of a challenge; the blend for Kentucky Fire Cured (KFC) MUWAT cigars took years to perfect. Handmade in Nicaragua at Joya de Nicaragua's facilities, both premium Nicaraguan long-filler tobaccos and tobaccos from Kentucky and Virginia that have been fire-cured over hardwood logs are used to make KFC cigars. Finished in a wrapper combination of fire-cured leaf at the head and Mexican San Andres leaf at the foot, the KFC is well-balanced, medium-bodied, and very unique with a slightly sweet and smoky flavor of roasted hickory, maple, and oak.